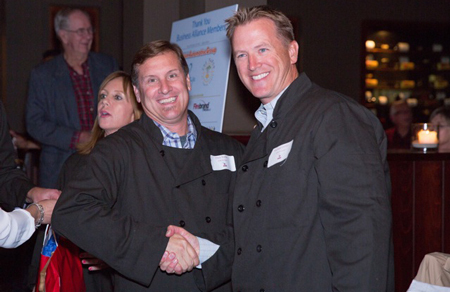 Community is served at SchoolPower’s Chef Challenge! Meet the dynamic top employee of SchoolPower, Robin Rounaghi, in this week’s Laguna Life & People feature! Robin’s enthusiasm for SchoolPower and her commitment to bettering Laguna’s public schools is paramount to the organization’s success! Thanks StuNewsLaguna for capturing Robin Hayward Rounaghi. Story by Samantha Washer. Photos by Mary Hurlbut — with Robin Hayward Rounaghi and 3 others. SchoolPower has presented the 2014 Hall of Fame Award to Firebrand Media for its unwavering support of local public schools. Firebrand, which creates nationwide publications, websites and marketing, produces local mainstays The Laguna Beach Independent newspaper and Laguna Beach Magazine from its Broadway Street headquarters. More than write about Laguna, Firebrand has supported the idea of community with more than $50,000 of in-kind sponsorship and revenue to the local education foundation. The groups’ collaboration began five years ago, when Firebrand signed on to help SchoolPower’s newly-created community event, SchoolPowerPalooza – the predecessor of SchoolPower’s Dodgeball Tournament. 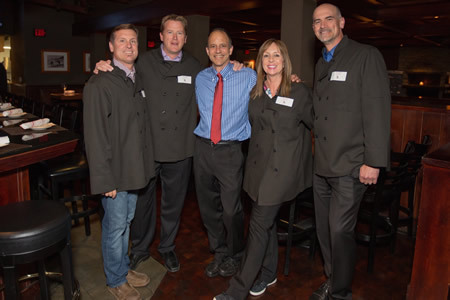 Subsequently, Firebrand named SchoolPower as its Montage fashion show beneficiary and became one of SchoolPower’s most generous Business Alliance sponsors. SchoolPower and Firebrand are currently partnering to increase the outreach of SchoolPower’s Laguna Locals Card, which offers discounts at over a hundred local businesses. Beginning in June, visitors will be able to purchase the Locals Card at Firebrand’s One Laguna, a multimedia center located on Forest Avenue that is equipped to help local residents and tourists get the most from the town. “As a partner, Firebrand is not afraid to try something new and maybe push the envelope a little bit. 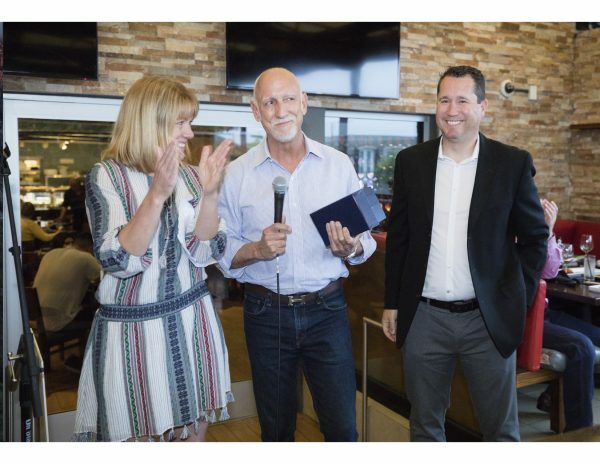 Firebrand has helped us create new programs and revitalized long-standing ones,” said Robin Rounaghi, SchoolPower’s executive director who presented the award at a June event at The Ranch. The Hall of Fame (aka “Claes”) Award was established in 2006 in honor of Hotel Laguna’s Claes Anderson, whose generosity paved the way for a new level of giving to SchoolPower. Previous Hall of Fame Award recipients include Donnie Crevier, David Wilhelm and Philo Smith, Hearts of Montage, David Wilson, Laguna Graphic Arts, Lumberyard and Fredric H. Rubel Jewelers. Sanchez says Firebrand is proud to be included on that list. 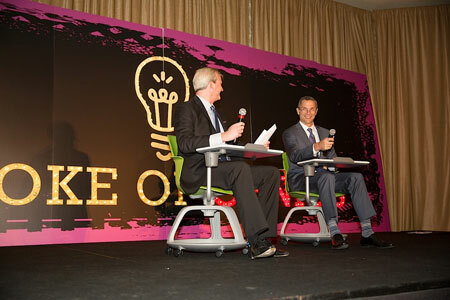 “We believe wholeheartedly in SchoolPower’s mission and we have a great partnership,” he said. “We only see things growing in the future. Left to Right: SchoolPower’s VP Business Alliance Mike Gilles, Firebrand Media’s Scott Sanchez and SchoolPower’s Executive Director Robin Rounaghi at SchoolPower’s Business Appreciation Party. Laguna Beach High School may be the smallest public high school in Orange County, but don’t tell that to its athletic program. Regularly competing against teams from much larger schools, LBHS teams have achieved great success against their larger neighbors. Dedicated athletes, parents and coaches, as well as a supportive community, are some of the factors that go into this success. Debbie and Greg Hexberg and their Hexberg Family Foundation, have gone above and beyond in their support of LBHS’ athletic excellence. First, they are committed parents of two LBHS student/athletes. Second, over the past three years, The Hexberg Family Foundation has given $80,000 to SchoolPower for the LBHS athletic program. With their only stipulation being that the money be spent where it would impact as many students as possible, the Hexberg Family Foundation has funded items as far ranging as hurdles for the track team, bleachers for the water polo and swim teams, and even locker in the girls locker rooms. “The Hexbergs have had a truly transformational effect on the LBHS athletic program over the past three years. Their donations have funded very tangible things; things necessary to maintain a robust athletic program. As a parent of two high school athletes, I am personally very grateful for all they have done,” said Lynn Gregory, SchoolPower president. This year’s donation of $30,000 refurbished the school’s weight room facility. New treadmills and new cardio bikes replaced outdated, worn out and even broken equipment, some of it over ten years old. “The reality of a school system is that they cannot always fund every need that coaches have. A complete weight and cardio vascular fitness center is one of those needs. Had the Hexberg family not stepped up with their generous donation we would still be struggling. This facility is used every hour of the day starting at 6:00am till after 6:00pm when we close. The more than 600 athletes and countless Physical Education students put this fitness center to the test every day…” enthused LBHS Athletic Director, Mike Churchill. LBHS principal, Dr. Joanne Culverhouse added, “Thanks to the generous donation of the Hexberg family, we are able to provide opportunities for our students to practice a healthy lifestyle. When I enter the weight room, I consistently observe our students working out on the treadmills and bikes. I am very thankful for the continued support of Debbie and Greg and the contributions they make to LBHS.” The weight room at LBHS is a relatively small facility that, like the school it serves, has a bigger impact than its size would suggest. The Hexberg Family Foundation’s donation refurbished LBHS’s weight room facility with new cardio bikes and treadmills. “SchoolPower allows us to go beyond the walls of the classroom and explore,” said Thurston science teacher Linda Hill-Lindsay, who received a 2014 SchoolPower Endowment Teacher Grant. The annual Teacher Grant Program, designed so ideas can be quickly funded and put into action, encourages Laguna’s teachers, administrators and classified staff to submit proposals that will have a direct impact on students. SchoolPower Endowment earmarked $82,417 for 16 teacher grants to be utilized this school year. Three grants totalling $11,080 were funded by the Brighter Stars Fund. Wendy Offield, a former president of both SchoolPower and SchoolPower Endowment, stepped forward to fund $12,359 of arts-focused grants. Teachers Sarah Benson and Kristen Kaa accept a $30,714 teach grant on behalf of the LBHS English Department. Right to Left: SchoolPower’s Executive Director Robin Rounaghi, LBHS Principal Joanne Culverhouse, LBHS English teachers Kristin Kaa and Sarah Benson. Local parents know the SchoolPower Student Directory is a post-Internet phonebook that remains relevant and indispensable. It is also a great source of added revenue to Laguna’s public schools, as the 2013-2014 edition raised over $76k. 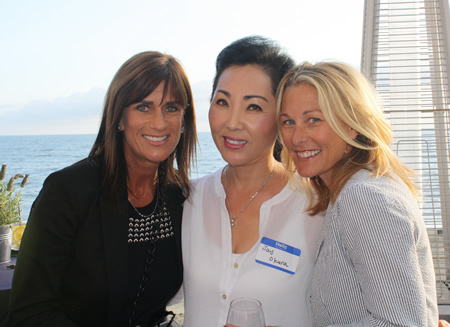 SchoolPower, Laguna’s non-profit education foundation, thanked Directory advertisers at The Bungalows at Pacific Edge Hotel on May 8. The event also honored members of the Business Alliance and the new Real Estate Honor Roll, two year-long sponsorship programs that are estimated to raise approximately $50,000 for the schools this year. The relationships also bring goodwill, as residents are encouraged to support the businesses that support the schools. Business Alliance members Pacific Edge Hotel and The Deck, who generously donated the food, drink and seaside venue, hosted the annual gathering of new and longtime business sponsors, LBUSD administrators and parents. Trustee Taylor Pillsbury, acting as auctioneer for coveted ad spaces in the 2014-15 Directory’s back and inside covers, orchestrated bidding that brought in $13,600. Jack Jakosky of Boat Canyon Shopping Center and Mark Christy of Hobie/Tuvalu and The Ranch at Laguna Beach won the prized spots. LBHS Principal Dr. Joanne Culverhouse with SchoolPower Directory Co-Chair Hilary Gilles and Business Alliance VP Mike Gilles. 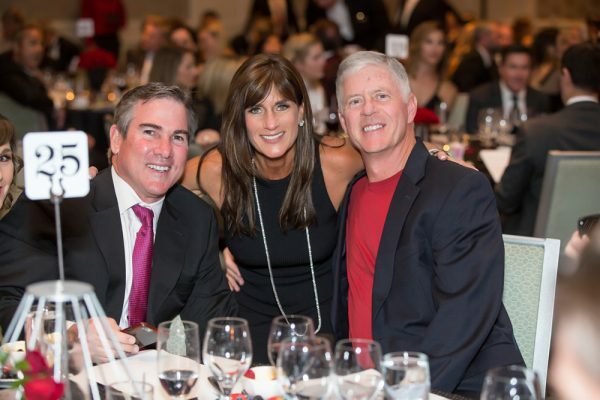 SchoolPower’s 29th Annual Dinner Dance, held March 1st, 2014, netted over $225,000 for Laguna Beach schools. The event, which drew over 300 guests to Montage Laguna Beach, dedicated a portion of the evening to raising money for an initiative selected at the recommendation of district leaders. This year’s Fund-a-Need, “Xtremely iNteractive,” requested Apple iPads, Apple TVs and Google Chromebooks and advances a long-term goal to create high-tech, interactive classrooms. The crowd raised paddles and pledged over $140,000 for this year’s Fund-a-Need, including an especially impactful and inspiring donation by Holly and David Wilson. In addition to their many contributions to the event, the Wilsons generously committed $37,880 to purchase Apple TVs and large screen monitors. Event co-chairs Amy Kramer and Nina Langton took the back-to-basics ideal of “Sowing the Seeds” to heart and enlisted talented parents to craft the dinner dance’s environmentally conscious décor. Succulents, wood and copper – even branches salvaged from the back of a landscaping truck – created an atmosphere that was serenely beautiful. In an added highlight of the evening, Rounaghi introduced a film honoring Ron LaMotte, Tow of the World Elementary School’s principal who will retire at the end of the school year. The crowd was quick to rise to their feet and give LaMotte a standing ovation. Thurston Middle School teacher Carl Nelson and students interact with iPads connected to a large monitor via Apple TV. SchoolPower Dinner Dance Chairs Nina Langton (left) and Amy Kramer (right) with their husbands Kirk Langton and Joe Kramer. SchoolPower guests and generous supporters Holly and David Wilson.